I hope you are having a great weekend. I would like to share a card I make for Merry Monday, MFT Summer School and Freshly Made Sketches! When I saw the current challenge at Merry Monday was pastels I thought I would give it a wide berth as I tend to go for bright, bold colours and didn't know where to begin with pastels. However, after reading one of MFT summer school lessons on colour saturation I thought..why not give pastels a go and challenge myself. 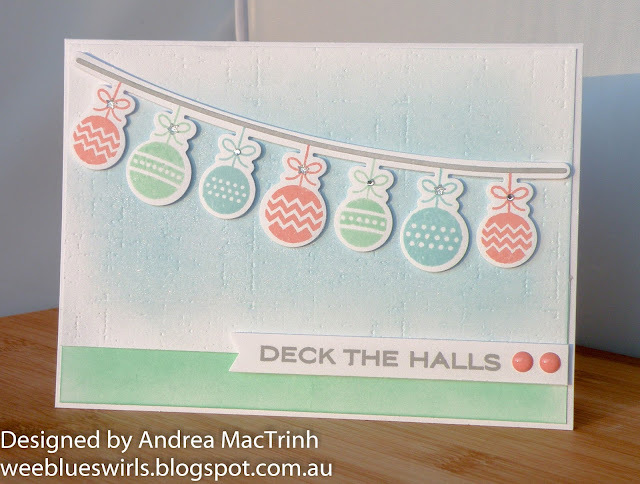 After spending a long, long time looking through my supplies and colours I decided to ink up my ornament banner builder by MFT and shockingly to use some inks for this card instead of my usual copic colouring. I thought the current sketch at Freshly Made Sketches would be perfect for the ornaments. For some background texture I used a linen impression plate by PTI. I lightly sponged this with pastel blue ink. I then added some clear wink of stella to the sponged blue area. I also sponged a strip of plain white card with SSS mint ink for the bottom of the card. The ornaments were stamped with Hero Arts Soft Pool, Soft Cantaloupe Ink and SSS Mint Ink and a tiny silver stone was added to each. For the sentiment and the banner strip I used SSS Smoke Ink. Love the texture on the background and those fun ornaments, Andrea! Thank you for joining us at Merry Monday! What a pretty string of pastel baubles, Andrea! Love that textured background too! Thanks for sharing with us at Merry Monday! This is so pretty - soft and peaceful! Gorgeous card. Thanks for joining us at Merry Monday and Freshly Made Sketches. What a pretty card! Your experiment with a new technique worked brilliantly. Thanks for joining us at Freshly Made Sketches! Be sure to join us again next week as we have a fun celebration planned for our 200th sketch. I love playing with sketches, but I'm no good at using non traditional colors for Christmas designs, but absolutely love what you've created here! So clean, delicate and festive!